Attention. You must log into Yandex to manage your playlists. Each playlist can contain up to 10,000 tracks. There are three ways to add tracks, albums, and playlists to another playlist. Click in the player line. On the page for an album or playlist, click and choose Add to playlist. New tracks appear at the end of the list by default. 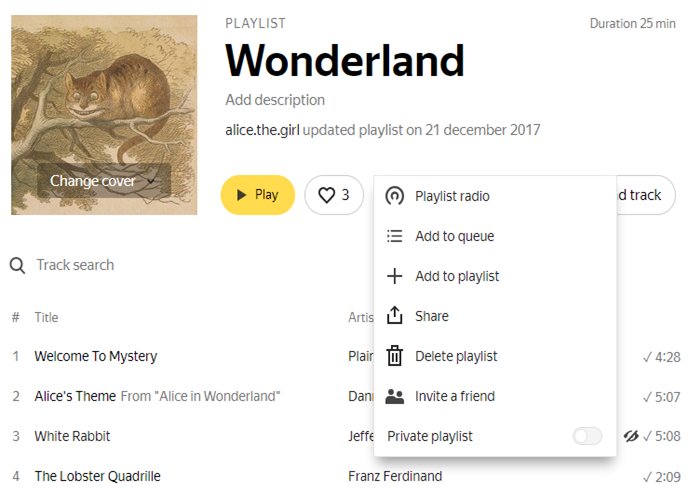 If you want new tracks to get added to the beginning of a playlist, go to the Yandex.Music settings and enable that option on the Other tab. Click on the playlist name to open it on a separate page. Click and hold a track, then drag it to a location in the list. Restriction. You can't change the order of the tracks on your Favorites or Liked on Radio playlists. Point the cursor to the track line and click . Note. To quickly find music in a playlist, go to the Track search bar and enter the name of the track or artist. Restriction. You can not edit your Favorites or Liked on Radio playlists. In My music, go to the Playlists tab. If you want to hide the playlist from friends and other Yandex.Music users, click and enable the Private playlist option.